Alkiona is the name of a bird who builds its nest on the edge of the rocks. "Alkiona" sits peacefully on a small rocky hill surrounded by the sea, with a uniquely magnificent view of the Saronic Gulf, just 7 minutes walk from the picturesque fishing village of Souvala on the island of Aegina. 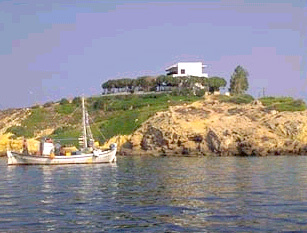 The island is only 25 minutes from Piraeus by Hydrofoil and 1 hour 10 minutes by ferryboat. 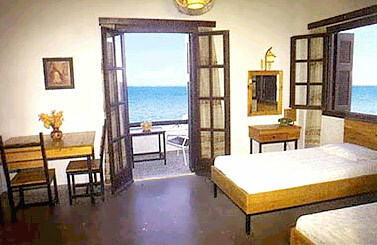 "Alkiona" has been operated as one of the nice small hotel apartments complex until December 2000. Now Alkiona has changed it's operation into a complex of fully furnished apartments available for sale. 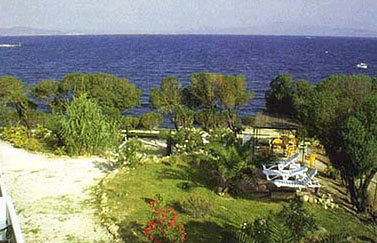 For this summer and summer 2004 some apartments will be available for monthly or seasonal renting. Alkiona has 14 large fully furnished apartments each equipped with a shower, a fully equipped kitchen, brand new A/C for cold and heating and balcony with unique panoramic sea views. There is a beautiful fully bloomed garden in front of the apartments and the sea, with deck chairs perfect for sunbathing. Alternatively, you can relax and enjoy your evening coffee at one of the two wooden kiosks, while watching one of the most beautiful sunsets in Greece. Alkiona is situated close enough to the heart of island life, yet far enough to offer you peace and tranquility. There is a choice of three different places to swim, close to the building and a fully equipped sandy beach, at 15 minutes walking distance. A very good variety of activities are available in the island; like Scuba diving, horse riding, speed boat trips and many excursions.